Less Mowing! Less Watering! Less Fertilizing! We all have better things to do than water, fertilize and mow the lawn! Developed in the 1990's by Wildflower Farm Eco-Lawn is a blend of carefully selected, certified fine fescue grass seeds that work together to form a slow growing, drought tolerant turf. So you don't have to put so much time, effort and money into your lawn! Eco-Lawn grows in full sun, part shade and even deep shade! Highly drought tolerant, once established, Eco-Lawn has a beautiful deep green grass colour. Eco-Lawn is quick to germinate but is slow growing and it requires less fertilizing and less watering due to its deep root system. Eco-Lawn can be mowed like a regular lawn or left un-mowed for a free-flowing carpet-like effect. Save Time, Save Money & Save the Environment! Experience what tens of thousands of people across North America already know. 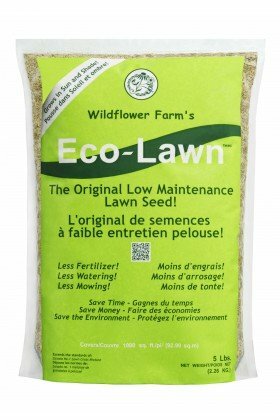 Grow an Eco-Lawn! If you have any questions about this product by Eco-Lawn, contact us by completing and submitting the form below. If you are looking for a specif part number, please include it with your message.